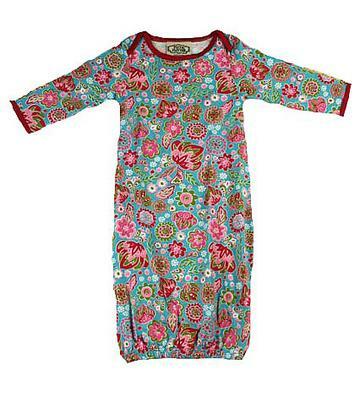 This beautiful gown is very practical for newborn baby girls. This blue, red, pink, green and white flowery print gown has a red trim along the neck and sleeves. It also has the mittens built into the outfit if you choose to flip them over. It is the yellow flowery print on the back of the sleeves that will flip over to keeps those hands warm and not scrathing the babies face. All mommies need these for night time feedings to change diapers easily because the gown has a band at the bottom that stretches to get over the tooshie.This is 100% cotton and very very soft!